In its second annual awards ceremony, WOSU Public Media recognized the most outstanding school district and teacher in Central Ohio through the Excellence in Education Awards. This year also featured a new award, Outstanding Leadership, which celebrates leaders in integrating technology into curriculums. The 2019 Excellence in Education Awards honored Michelle Lombardi, a media specialist at Jones Middle School in Upper Arlington City Schools with Outstanding Teacher, and Stephanie Howell, an Instructional Technology Coordinator at Pickerington Local School District for Outstanding Leadership. Hilliard City School District was recognized as the Distinguished School District. 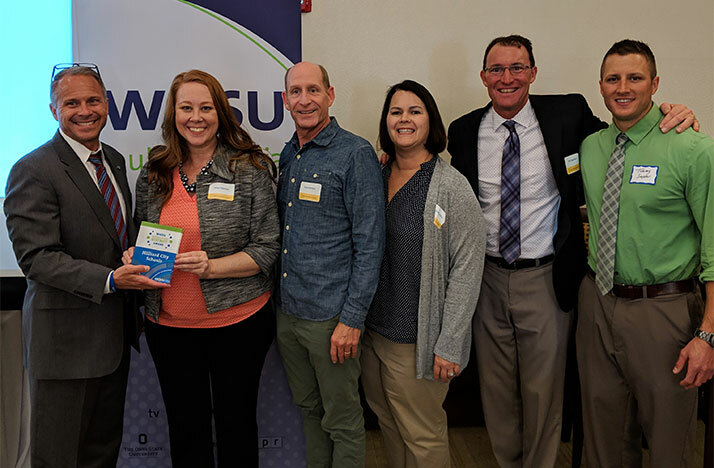 Chosen honorees embody excellence and innovation by implementing technology in their schools and were recognized at WOSU Classroom’s annual Innovation Mixer on Tuesday, April 9. Nominations are evaluated on criteria that center around the effective use of technology, sound pedagogical practice, community involvement, and evidence of student achievement. Staff members of the Hilliard school district accept the 2019 Distinguished District Award given by WOSU Classroom as a part of the Excellence in Education Awards. Five years ago, Hilliard implemented a one-to-one model with iPads. They also use Double Robots for children who can’t be physically present in school; these children video call into class every day to learn with their class, and are able to watch lectures and participate in class in real time. 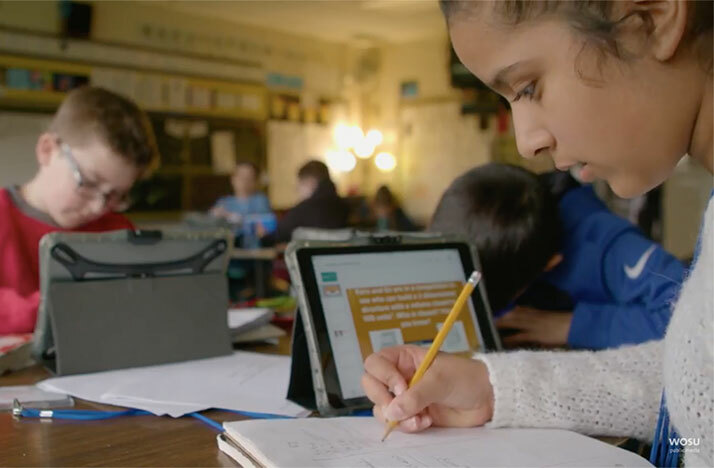 “We wanted technology to become more of an organic process in the classrooms as opposed to being an event,” Boettner said. Hilliard Superintendent John Marschhausen sat down with WOSU’s Columbus Neighborhoods to discuss implementing the technology in the classroom. Michelle Lombardi of Upper Arlington does similar work by integrating virtual tours into classrooms, and even has the students build their own virtual worlds. Her most recent work involves helping students create virtual tours of settings they read for class. “Using technology makes students feel empowered,” Lombardi said. While assisting students with their projects, Lombardi also hosts virtual field trips with the staff to teach applications of Virtual Reality in the classroom. 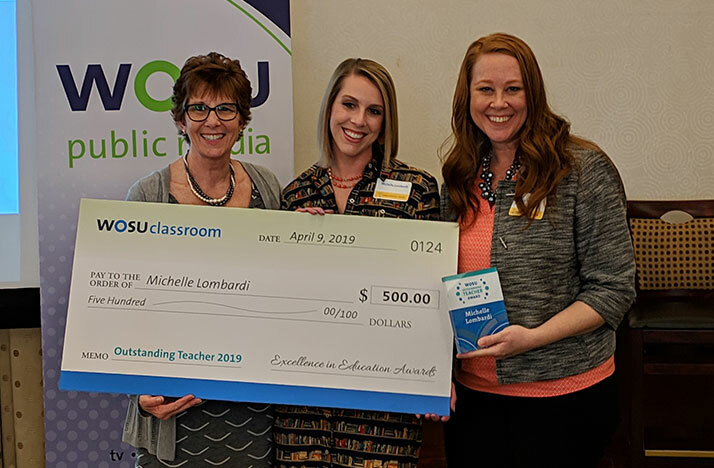 Michelle Lombardi (center), a media specialist at Jones Middle School in Upper Arlington, accepts her Outstanding Teacher Award along with a $500 classroom donation from WOSU Classroom’s Amy Palermo (right). Lombardi was nominated by Kathy Preston, a teacher at Jones Middle School. At Pickerington Local Schools, Stephanie Howell created a “Chrome Squad” with the students in her district. The teachers elect one or two students in their homeroom to attend short training sessions with Howell to helps with all Google-related problems in the classroom including helping fellow use Google Read and Write, help teachers navigate Google Classroom if they need assistance, updating the Chrome internet browser and more. The award winning educators and schools all share a common vision that focuses on the learning needs of the individual student and apply technology applications in creative, meaningful ways. “The students have really taken initiative on what kind of projects they want to create once they learned how to use the design lab,” Howell said. 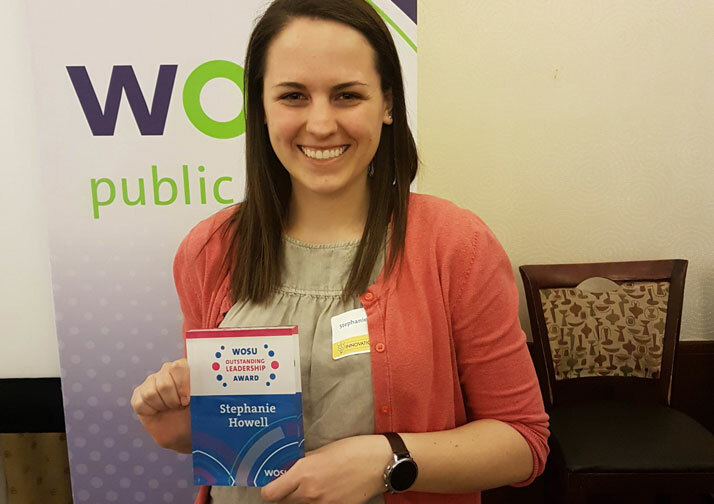 Stephanie Howell, an Instructional Technology Coordinator in Pickerington Local School District received the 2019 Outstanding Leadership Award. Each of the award winners received a prize package including commemorative plaques, banners for the outstanding leadership and distinguished districts to display at their respective building, a $500 classroom donation for the outstanding teacher and a selection of books to help with their continued growth and learning. In addition, the award winners will be celebrated across all of WOSU Public Media’s platforms in the weeks to come.